This 2006 Dufour 44 Performance is powered by a Volvo Penta D2-55 55hp diesel engine. She is driven by a sail drive with an EWOL 3-blade feathering stainless steel propeller. Her engine hours are approximately 2800. This Dufour 44 Performance is equipped with a 3 spreader aluminium mast and aluminium boom with reinforced boom vang. She has a Facnor Roller Furler (new 2016), a Sailtec hydraulic backstay, removable inner forestay and spinnaker pole. Her running rigging is mostly Dyneema. Her sail inventory includes: 2x mainsails, 2x genoas, spinnaker and a heavy weather jib. 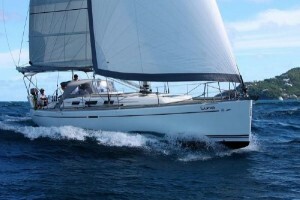 This Dufour 44 Performance owners version provides accommodation for 6 within 3 double cabins. The owners cabin forward features a double bed, hanging wardrobe, and seat. There is also and ensuite bathroom with head and shower. There are two further double guest cabins aft and a guest bathroom with head and shower. The comfortable saloon of this Dufour 44 includes a U-shaped sofa with dining table and a second sofa opposite. There is a navigation stations with chart table and seat. The saloon furnishings are finished with white leather upholstery, there are heating outlets throughout the saloon, cabins and heads. The galley is in a seaworthy corner configuration and is well equipped with a refrigerator with freezer compartment, 3-burner gas stove and oven with grill, and a sink with hot and cold water.